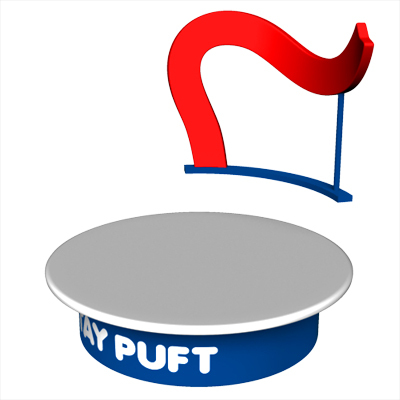 Another item I was thinking of creating for the interior of the Ghostbusters Tiny House, a round bed design based on Stay Puft’s sailor hat. It wouldn’t be a life-size replica, but this large bed would be an eye-catching addition to any geek’s bedroom. I made the red tassle into a headboard for this design, but if you wanted you could ditch the headboard and attach a loose red tassle to the center of the blanket and have it hang over the side, just like the actual hat. Not pictured: white pillows and a white blanket, to blend in with the hat. On a related note, I’m surprised no one made a round bed based on the OREO cookie. Looking at round beds for my research I was constantly reminded of the cream-filled snack. Now you can share my craving! I’m so evil.